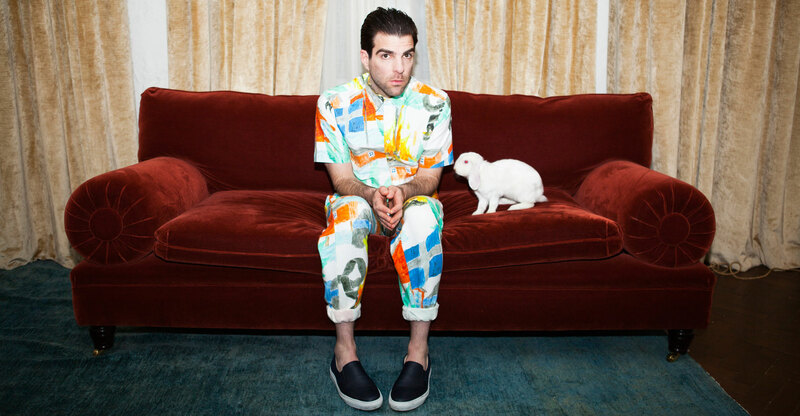 Mr. Quinto, are you a religious person? I grew up Catholic and my mom remains to this day really motivated by her religion. I ascribed to that through high school and I was pretty active, but when I had the ability to make my own decisions, I realized that I would rather explore a sense of being spiritual than religious and that started to clarify for me through college. Looking back would you say that it was beneficial for you to be at least exposed to religion at a young age? I think it’s important to have an awareness from a young age of what people grasp onto in order to feel some sense of foundation in their lives. Because if you don’t have that, then I think you’re potentially more likely to grab onto other things that are just distractions. At least if you have that seed that’s planted, you can allow it to grow for yourself. My dad died when I was young and I think that also enhanced my awareness of spirituality. Because you start to think with more perspective when you lose somebody so close to you? Exactly. When you lose a parent or you have a trauma at a young age, I think it’s inevitable that you’re going to think bigger and deeper than you would otherwise. But I think my mom was always a little disappointed that I wasn’t more moved to Catholicism, that I didn’t absorb that path. But the church is a difficult, very judgmental organization. It just seems so counterintuitive that any organization that predicates itself on the teachings of Jesus would be so aggressively exclusive of people or judgmental or hateful towards people in certain ways. And then all of the underlying hypocrisy and straight-up scandalous scenarios that are rampant in the church, it just feels really un-integrated. And I want to be an integrated person. I do think that I can draw on my exposure to those teachings when I was younger to some extent, but there are just too many discrepancies that I can’t reconcile for myself. And I’m not interested in it. I’d rather pursue my own path. Is that how you ended up going on a spiritual retreat to Peru? I know a lot of people who have gone there to take ayahuasca in a traditional ceremony under the guidance of a shaman and have had life-changing spiritual experiences. Yeah, friends that had been to Peru told me their stories and I was at a place where I wanted to dig deeper in my own experience, so I started to do a lot of research and I ended up there basically by researching a place that felt both safe and in line with what I wanted to tackle in myself. Did you go by yourself? Yes and I had an incredible time. It feels to me like the kind of thing that, once you engage it and realize what is possible, it feels like a through-line for me. I want to revisit it, I want to go back. Would you describe ayahuasca as medicine or as a drug? I really feel like if you enter into this experience with a kind of openness, I really think it can be tremendously healing. I think it is a medicine. I don’t think it is a drug. I think a drug is something you do for fun. Ayahuasca really physically, as well as emotionally, has the power to heal. And I experienced that in a lot of ways. Did you meet yourself when you were younger? I’ve heard of a lot of people having that experience. Yeah. Well, we were there for two weeks and so we did seven ceremonies while we were there. Each one was very different and I met many different versions of myself. (Laughs) And my younger self was one of them. It’s incredibly powerful, but the lessons can also be brutal. You have to be open to it and let it guide you and be available to what it has to teach you. Oftentimes the most brutal lessons are the ones you need to learn the most. I don’t know why, but I’ve really been thinking a lot lately about, “Why am I doing what I’m doing?” When I was in college I felt limitless and I set these goals for myself and I was madly driven by these goals. Now I’ve accomplished most of those goals that I set for myself and I’ve been asking myself a lot, “Now what?” I’ll be 37 in a couple of months and I never really imagined myself in my late 30s. Are you enjoying it or does it make you anxious? It’s a very interesting time. I feel sometimes really perplexed and frustrated and unsure and then other times really inspired and almost sort of reconnected to that idealism, that optimism, that sense of possibility. So, I don’t know how it’s going to play out, but I’m fascinated by it and I’ve been really acutely aware of it lately, for sure. How did you end up acting in the first place? I think my dad’s death had a lot to do with it, because it thrust my whole family into a new dynamic. My mom all of a sudden had to provide for me and my older brother, and my brother had to step up and be the man of the family. It left me a little bit isolated and I think my imagination kicked in in order to compensate for that and I think that ultimately is what led me to pursuing it. Was acting itself also a kind of escape? It became somewhere where I could work through some of the stuff that I might not have had the tools to work through otherwise. I think it was a pretty psychologically necessary thing for me, actually. And then I fell in love with it and it became clear that it was something I wanted to pursue. You started a film production company several years ago. Was that a way of setting goals for yourself beyond just acting? Right around the time when I got Star Trek I thought, “This is the zenith of where I’ve been so far, so I want to make sure that I can continue to build rather than diminish.” I realized the level of exposure it was affording me and that it only lasts so long, so I started the company and it’s been one of the most fulfilling creative experiences that I’ve had. It’s constantly about balance. It’s constantly about balancing the business side of things and the creative side of things. I think that’s a very fine line and you have to tread it with real vigilance. It’s probably pretty easy to get sucked into the Hollywood machine if you’re not careful. It’s very intoxicating in a way. I feel like it’s the Sirens on a rock. It can really draw you in, it can really be mesmerizing and magnetic and if you allow yourself to go unchecked, you’re going to run aground. And I try to listen to my own voice and the voice of the people that I trust immediately around me to help navigate the sometimes choppy waters. It becomes about so many other things. It becomes about the industry, it becomes about distributors. About money for Oscar campaigning. When All Is Lost came out, which you produced, people were saying Robert Redford was a key contender for an Oscar, but in the end he didn’t even get nominated. Frankly, I think it comes down to how badly someone wants it and one of the things that I respect most about Bob is that he doesn’t define himself by that. He’s literally a living legend, he’s accomplished so much creatively and philanthropically, that he doesn’t need that kind of recognition and he certainly doesn’t need to fight for it or pay for it. And I respect that. Of course I would have loved to have seen him be nominated and recognized for that work, but I think that was an important lesson for me as an actor. You can’t do the work to be recognized for the work. It’s deadly. You also demonstrated that kind of disregard for other people’s opinion when you came out as openly gay. When you did that, you had no idea what might happen as a result. But I had reached a point in my own life and in my own journey where measuring against other people’s expectations or judgments wasn’t of any interest to me anymore. It had been for years before and that is why it took me a long time to get there, but I can’t imagine the amount of energy and effort that would have to go into maintaining the lie of being who you’re not. And maybe that means I have a different journey, but it’s just not interesting to me to live any other way. I also feel like things are changing so radically and so quickly, that I wanted to be a part of that change and stand up and be counted. Especially since I have the chance to really affect other people’s lives in a positive way. And has that been your experience? I can’t tell you how many young people I’ve either met or gotten letters from that have explicitly shared with me the difference that it made to them. That’s something that I can leave behind and know that is a part of the positive impact that I’ve been able to have. It doesn’t add up to anything if you just keep it to yourself. I take very seriously the distress and the pain of the young people in the world that are not met with the kind of support and acceptance that I’ve been met with in my life. I want to try to do what I can to help them and to let them know that it will pass and it will change and – as cliché as it’s become – it will get better. It was good timing because you had just played Spock, which was a big success and most likely a recurring role for you. They couldn’t have replaced you. That would have been a horrible move, even for Hollywood. When I made that decision I was doing the press tour for Margin Call and I used that as the opportunity. Not because I was afraid of the press in association with the Star Trek franchise, but because I wanted it to be on my terms and this was a movie that I was responsible for making and producing. I didn’t have to worry about any kind of studio reaction or any kind of internal Hollywood response to it. It was a movie that my company made, that wouldn’t have existed if I hadn’t gotten to the point that I was at in my career, and I thought, “I’m going to use this platform to engage in a conversation about who I am and who I want to be.” And there was something empowering about that because there wasn’t anybody there to tell me not to or to try to control the reaction. I was very grateful for that.